Tramvaie in Brno, part 1. 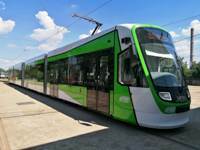 Breaking: a tram has collided with an electric trolleybus in central Brno this afternoon shortly before 14:00. According to preliminary reports from Brno firefighters HZS JMK, an estimated 40 injuries have been recorded at the scene, five of which are serious injuries. More recent estimates pinpoint the number of injuries at 38, with 12 serious injuries. “It is a mass accident, the paramedics have divided the wounded according to the severity of their injury,” fire brigade spokesperson Jaroslav Mikoška told Novinky.cz at the scene. Both the tram driver and trolleybus driver are among those with serious injuries, though neither have life-threatening injuries. The collision occurred at the Masná tram stop in Brno’s city center; its cause is currently unknown. Because a stroller has been recovered at the scene of the accident, some have speculated that the accident was a result of the trolleybus driver swerving to avoid hitting a woman with a stroller crossing the street on a red light. “I know about this speculation, but I cannot confirm or disprove it at the moment,” Hana Tomaštíková, spokesperson for Brno’s transit authority, told iDnes.cz. Busy Křenová street in central Brno is currently closed to all automotive and pedestrian traffic as police and firefighters attend to the accident. According to safety inspectors, the tram did not contain any passengers at the time of the collision. Damages have been initially estimated at over one million crowns. This is a developing story; we will update as more information becomes available. A apărut și un film, dar nu se prea vede nimic traversând prin fața troleibuzului. Mai mult, dacă una cu căruciorul traversa pe roșu prin fața tramvaiului și apoi a troleibuzului, iar troleibuzul ar fi ocolit-o și a intrat în tramvai, atunci individa și-o fura suprem de la mașina care a trecut și aceea în viteză pe lângă troleibuz și nici măcar nu a încetinit, deci puțin probabil ca asta să fie cauza.